Independence – it’s something that our children so desperately want, but something that I think as parents, we are sometimes nervous to give. When they’re young, it starts off easy, “I do it!” I can’t tell you how many times I heard that when my kids were tiny. Whether it was wanting to feed themselves, or brush their own hair, dress themselves, you name it, “I do it!” was very often my children’s response. As they get older, however, giving them a little more independence starts becoming trickier because the consequences aren’t as simple as, “Well, I guess you’re going to be wearing a flowered shirt, with polka dotted top, and hair styled like…well, like a 3 year old did it.” Instead, the questions can sound a little more like, “Can I ride my bike over to my friends house?” or, “Can I go shopping at the mall with my friend…without you?” Sometimes, it can be a parent’s question as to when are they ready to take on more responsibilities that requires a little more independence, like; “When are my kids old enough to stay home alone?” All of a sudden, the questions aren’t as easy to answer. So, we reached out to our friend, Christine Ramich, Ph.D. and licensed psychologist, who gives us some great insight on some of those tough questions. It’s that time of the year – back to school! We encounter many tips and strategies for helping our children as they adjust to the new academic year. Perhaps we want our children to be more organized, try fresh study strategies, or participate in sports or activities. As they embark on this adventure, we have many goals for our children, such as feeling secure, exhibiting confidence, and creating balance. 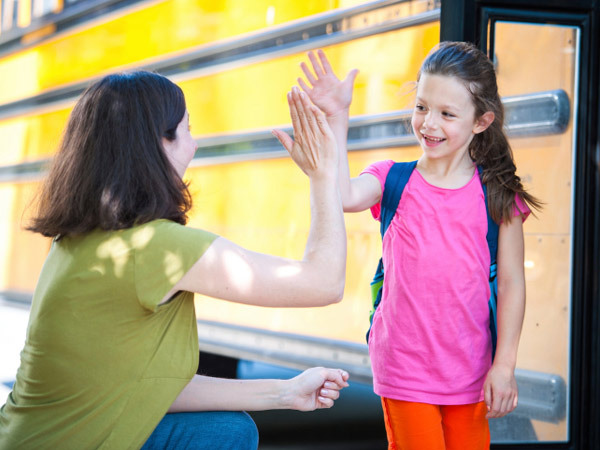 It’s easy to forget that the way parents cope with the transition to school can have a huge impact the ways that children adjust to all of the changes. Children face enormous stresses these days, and so do parents! Pressures of work, school, children, extended family, etc. seem to fly toward us like tennis balls getting hit, in rapid succession, to our side of the court. Adding the transition back to school simply increases the number and rate of the onslaught! Sometimes it feels like all we can do is hit a few back over the net, just to begin to chip away at the tremendous pile at our feet. It is very important to take steps to try to manage our own stress, so that we can think more clearly, make thoughtful decisions, and model problem solving skills. Parenting can feel like it is full of difficult decisions. We want to instill good values in our children. Often, the ideals that parents teach are complementary. But what happens when virtues compete? Parents face difficult decisions when faced with a situation where two (or more) important values seem to be in opposition. The conflict of the two competing values is evident when parents face the decision about whether a child is old enough to stay at home alone. In the process of figuring out when a child is ready to stay at home alone, we can find ourselves trying to create balance among multiple factors. We want to keep our children safe, avoid potential dangers, and try to protect them from exposure to unwanted influences, but also provide the opportunity for the development of independence, self-confidence, and freedom. As we assign weights to and prioritize these various components, we can consider the circumstance (e.g., amount of time, time of the day), environment (e.g., laws, access to help in an emergency, neighborhood safety), and individual development (e.g., maturity, responsibility, experience, and problem-solving and decision-making skills). Thoughtful contemplation, as well as consultation with children about their own sense of readiness, can help tip the scales toward a decision that is comfortable for you and your family. Children can gradually gain more opportunities for greater independence in the context of support and practice. Many parents fear that a decision that they make about their children will unintentionally result in harm. Some might think, “If something happens to my daughter when I’ve given her freedom, especially if I wasn’t 100% comfortable with the decision, then it’s at least partly my fault.” Unfortunately, parenting is messy and life is not neat. Parents can do their best to weigh the various risks and benefits and make the best decision at the time. We hope that positive outcomes, in both the short and long term, far outweigh the negative results. I sometimes compare aspects of difficult decision making in parenting to playing a card game. You are holding seven cards in your hand and have to make a play. But there is a catch: some of the cards are visible, while others are blank or covered. Sometimes you can see five or six cards, but other times you can only see two or three. Regardless of how many cards you can see, you have to make a decision about which cards to play and make a move. Once you make a play, you can sometimes see immediate results, but other times you have to wait. Sometimes you’ll make what turns out to be a great play, and other times the results will not be what you hoped. What might look disappointing in the short-term might turn out to be a great result over time. In whatever way the cards fall, you’ll learn from your successes and missteps. There will be more hands to play, with constantly changing rules and conditions as your child grows and matures. Although it can occasionally feel like we are on our own, we have a whole network of support for helping us decide what cards to play. We can get “hints” about what the covered cards might be and what plays to make. Research, life experiences, and consultation with family, friends, and professionals (teachers, doctors, therapists) can help us make parenting decisions, but at times we simply are forced to take an unavoidable leap of faith. Parenting is a difficult job, no doubt. However, when we are thoughtful and utilize the supports and information available to us, we increase our chances of making decisions that work in positive ways for our children. Taken further, the card game concept can be applied in the context of parenting in a larger community. Each parent holds a separate hand of cards for each decision. Sometimes the plays complement each other, and sometimes they are in direct conflict, and suddenly parenting becomes even more complicated and complex (e.g., Why can’t I go to the party? My friend’s mom is letting her go!). It is hard to make a play that is unpopular with our children, and even harder when another parent has made a different choice. If we are lucky, sometimes parents “tip their hands,” share thoughts about strategies, or even “back up” another parent’s limit setting. Ultimately, parents have to comfortable with their decisions about their own children, based on the needs of their children and the family. Over time, one of our goals is to help our children learn to play their own card game, making their own decisions as they gain more independence. How can we help our children uncover as many of the cards as possible, in order that they are encouraged to make healthy, safe, and informed decisions? We can talk with them about safety, resources, responsibilities, consequences, and the like. We can even review the rules of the card game, model our processes for making choices, and discuss our perceptions about strategies for success. However, as our children become more independent, they will increasingly have more of the responsibility to make the moves on their own. As parents, we hope that our children are able to playing their cards thoughtfully, as evidenced by making carefully considered, purposeful choices that bring happiness to their own lives and their communities. Christine Ramich is a Licensed Psychologist with clinical interests in child development and parenting from infancy through adolescence, school consultation, psychoeducational evaluations, and multidisciplinary assessment, who values strengths-based approaches. She moved to Charlotte in 2001 and is thankful to be in such a fantastic city with her husband and children.